The Recycle This Guide to Recycling Baby Stuff | How can I recycle this? Because they frequently have goo coming out of both ends, outgrow things really fast and change their physical, mental and culinary requirements every few weeks, it all too easy to create a little mountain of rubbish around a baby. Want to reuse or recycle something baby related that isn’t mentioned on here? Just let me know and I’ll add it to the site. How can I reuse or recycle baby food jars? 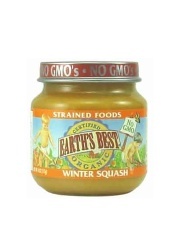 Most baby food jars tend to be glass so they can be recycled along with your other glass bottles and jars. Remember to remove the lid first though and recycle that with your usual metal/plastic (as appropriate) recycling. If you’d prefer to reuse them though, how about screwing/nailing the lid to the underside of a shelf? 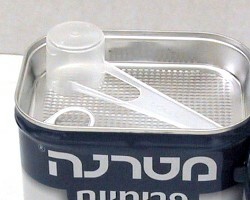 you can then screw the jar in and out of the lid as needed. Perfect for storing other nails & screws, fuses or even seeds. If you’d prefer to do something more crafty with them, they are a perfect size for transforming into a mini sewing kit with built in pin cushion. Very cute indeed. How can I reuse or recycle measuring scoops/spoons from baby formula cartons? Though plastic, most manufacturers (that I spoke to about it) say their spoons aren’t recyclable – but if the type of plastic is identified on the spoon (by a number in a triangle or the like), you might be able to recycle it with your usual plastic stuff – different areas have facilities to offer different types of plastics so check with your council. Aside from measuring baby formula, they’re perfect for measuring other things around the kitchen too – so keep a few around for measuring out small quantities of flour, baking powder, loose tea/coffee, spices etc. If you’ve got loads of spoons, each thing could have its own dedicated spoon! Bigger ones can be used as washing powder scoops too. Flat bottomed scoops might be useful as little tiny pots for crafters: use them to hold seed beads or findings, or small quantities of paint or glue when you don’t need more than a few dabs at a time. 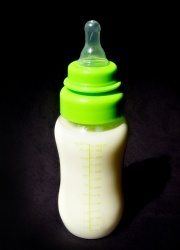 How can I reuse or recycle babies’ bottles? These days babies’ bottles tend to be made from an “unbreakable” plastic for safety reasons – depending on the recycling schemes in your area, you might be able to recycle it with your usual bottles and jars (different areas recycle types of plastic). Remember to remove the lid and teat first though – that’s usually a different type of plastic. Reusing them around the home is pretty easy too though: take advantage of the non-spill teat-top and use it as a oil bottle for use on squeaky doors; or fill them with paint for kids’ art sessions. Or to reuse them for their original purpose, local children’s charities might take them for sterilisation & redistribution to new mums in need, or ask at your local animal shelter to see if they need bottles for hand-rearing animals. How can I reuse or recycle hard plastic baby wipe containers? It’s super easy to “reduce” these even if you want to keep buying baby wipes: just buy one hard pack and get refill packs from then on. The plastic container might be recyclable with the rest of your plastic. Check the bottom of the box for a number. Again, the lid might be a different type of plastic so check that too just in case. Once emptied of wipes, the plastic box has a number of handy uses around the home: because it’s water resistant and solid, it would be perfect as a home for a first aid kit or a small emergency kit, or for storing photographs or important documents in. They’re also reasonably light considering how crush resistant they are, so would be great for posting fragile items through the post. How can I reuse or recycle babies’ dummies/pacifiers? How can I reuse or recycle mixed material baby milk containers? How can I reuse or recycle a damaged baby car seat? I hot wash the wipes in my cloth nappy cycle and recycle them again by making a mixture of water, a few squirts of baby wash, 5 drops of tea tree oil and and 5 drops of lavender oil. The wipes along with some cloth ones are rolled up, packed neatly in the wipes container and the mixture is pored over to just cover the wipes. The tea tree oil prevents the mixture from going sour and you have fantastic smelling wipes all wet and ready to go. Depending on the brand the wipes will last at least 5-10 washes. I have saved heaps of money by doing this. I use the cloth wipes for sticky number twos and the recycled wipes are great for number ones. I don’t use the recycled wipes for face or hands. I have a seperate container of flannels on the kitchen table with the same sort of mixture with slightly less baby wash in it. It never occurred to me to wash disposable wipes so thank you! 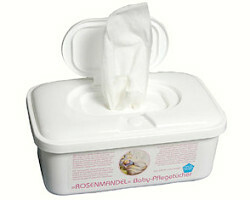 We use washable wipes normally but are using disposables as the moment due to washables being a bit harsh on nappy rash. We just use water and a couple of drops of tea tree oil in our wipes container (which just happens to be a re-purposed baby wipes container) so it’s interesting to hear what you do, thanks. Baby wipe containers are agreat way to get organized I have two girls and I use them to organize their hair stuff like bows etc also great for some toys like barbie shoes or pollly pocket toys, crayons anything small then you just label the side with whats in it and they stack great too. 1.Save those gowns and footed sleepers. You can never have too many to change into after a spit up or a diaper failure. Stains don’t matter and the cotton fabric gets softer and more comfortable with each trip through the laundry. 2.My girls’ used crib shoes and socks still look brand new even after being worn by three babies. If you know how much soft soled leather baby shoes cost you know that this is a very good example of saving money by recycling baby stuff. One caution that I would add is to be sure that you store them in a dry place between births as I lost a couple of pairs to mold (or was it mildew) when I put them in a cardboard box on the floor of the closet. 3.Strollers and baby beds are expensive and big money savers so long as you keep up with recalls. I actually came out alright by selling mine and buying newer models used for my second and third baby when storage space at my house was scarce. I didn’t feel guilty because by buying used, I was still recycling baby stuff and keeping it out of the junkyard. I raised 4 babies without a single bottle, formula, etc and virtually no disposable diapers or baby wipes except for travelling. Look at the picture of the baby food jar -you could probably buy a whole yam for the price of that jar and feed the adults also! You are attacking the issue from the wrong end- reduce your consumption first, then worry about recycling if you have anything to recycle. Gee, thanks. That’s probably the point of this website. We’re all not so perfectly enlightened as you. Me too, I raised 3 children without any bottles, formula, baby food or disposable nappies. I just cooked all our food without salt, reserved some for baby, liquidised or mashed it and kept it frozen in little containers for when needed. A much simpler, cheaper and saner way to bring up babies. Actually I’m simply too lazy for the whole sterilisation thing, so I avoided it by exclusively breastfeeding for a year. Well good for you. Not everyone is able to breastfeed (no matter how much they wanted to, or it breaks their heart) so we don’t all get to be superior. These days babies’ bottles tend to be made from an “unbreakable” plastic for safety reasons – depending on the recycling schemes in your area, you might be able to recycle it with your usual bottles and jars (different areas recycle types of plastic). You can turn empty baby food jars into musical instruments for older children – just fill with lentils or beans to make a fun sounds. Just keep your new instruments out of baby’s sight unless you seal the jar! This remind me my old days, I used to make such kind of toys to my sister when she was 3. Maybe I will do some for my children in future. Did you know, Ella’s Kitchen has partnered with eco-innovators TerraCycle to collect baby food pouches (regardless of brand)! You collect the pouches at home, and when you’re happy with how much you’ve collected, just get a free royal mail shipping label from your account on terracycle.co.uk, stick it to the box containing the pouches (can be a shoe box, anything really) and take it to a post office. When your shipment is checked in, your online account is credited with 2p per pouch, and then twice a year that money is donated to a school or charity of your choice! In return, the pouches are not only diverted from the landfil (unfortunately they are made from mixed materials, so they are not recyclable) as they’re UPCYCLED into new products, such as baby bags and bibs. It’s great that people are still concerned about recycling when faced with the overwhelming pressure of taking care of a baby. I’m sure some people would use that as an excuse to slack in that area. I recall in one of houses as a child, we had the exact setup you mentioned with baby food cars screwed underneath a shelf. It was a great garage storage system for various nuts, bolts and other odds ‘n ends. Just make sure that you don’t simply throw that stuff in the trash. I use the hard shell wipes containers as bathroom organizers. Specifically, I put some hair care bottles in, a small glass baby food jar filled with mini hair braiding rubber bands (another repurposing idea), another with bobby pins in it (great for keeping them in one safe place), also keep bows, etc in them. Keeps your kitchen counter nice and uncluttered. When I moved, I kept all of my essential travel sized toiletries in a hard shell wipes case and kept it in the front of the car with me, so no digging in all the packed stuff just to find my toothbrush or soap or anything. I also like to keep my kids’ blocks in them, for lack of a proper block container, it works exceptionally well. You could also put toy cars in them too… they are always such a pain to step on. More ideas for glass food jars, I am artsy craftsy and keep beads, pre cut paper shapes, rubber bands, cotton balls, etc in them. Liquid glue even stays good in them for SEVERAL months (6-12 even in dry environments) and if you need only a little just use a cheap paint brush to get the glue out. You can also put jewelry in them if you dont often wear it like me. I have even put Gatorade drink mix powder into a clean baby jar and gave that to my father once when he ran out of his own drink mix temporarily. So, I would say they’re good for other things too, thats all i can think of right now though. Woah this blog is excellent i really like reading your posts. Keep up the great work! You know, a lot of individuals are hunting round for this information, you could aid them greatly.